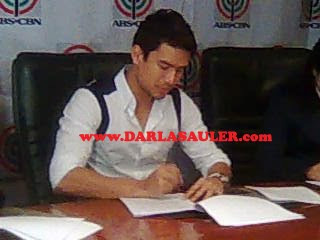 FIRST HERE : Christian Bautista, pumirma na ng bagong contract with ABS-CBN! Okay... after ng maraming usap-usapan, at lipatan... finally po ay heto na ang malinaw na truth about Christian Bautista and ABS-CBN. "After my contract expired in ASAP, ABS worked out a network contract for me this year. I'm very grateful to ABS because they've been behind me all these years in developing me as an artist." Great news! Good luck Christian, we're looking forward to see more of you sa ABS-CBN shows, and hindi lang sa ASAP XV! Thank you Ms. Hervie Bautista and Chiclet for the photos! YESSSS!!! !kapamilya pa rin c ian..
me too...im excited to see karylle & christian in a teleserye together ! !